In this chapter, we study another interfacial phenomenon: the formation of viscous fingers in a Hele–Shaw cell. This phenomenon occurs in an entirely different physical system from dendritic growth, but it raises similar issues and can thus be treated using the same approach established in the previous chapters. 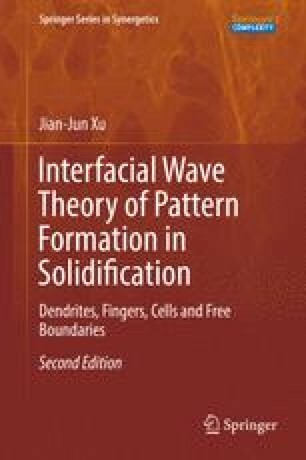 We are interested in the study of this phenomenon in this book, not only because the subject itself occupies an important position in the field of pattern formation, but also because the resolution for this problem provides a keystone for analytically studying further pattern formation problems in solidification, such as cellular growth and eutectic growth.